27/07/13 -- Well, in the two races mentioned at last night's York meeting the first was won by the horse drawn 19 out of 20 and the third race (13 runners) went to the horse drawn 10 with 11 coming second. Continuing with the same theme, today's big sprint handicap is the 3.30, with the horses drawn highest being the well fancied Khubala (7/1) drawn 17, Rasman (18/1) drawn 18, Regal Parade (33/1) drawn 19 and Secret Witness (20/1) drawn in trap 20. I'm gonna do Khubala to win under the peoples favourite Frankie Dettori, with an optimistic shoot for the moon 12 x straight forecast bets for the first two to come out of this lot in any order. It's better than doing the lottery anyway. There's anther sprint handicap later in the card, which only has 7 runners so the draw advantage may not be so pronounced and the odds certainly won't be so large. For what it's worth though the high draws are Hello Beautiful (7/2) drawn 7 and Baytown Kestrel (4/1) drawn 6. 26/07/13 -- Soycomplex: The market closed mixed, with front months lower but new crop higher. After three days of pretty dramatic action today was a relatively calm affair, maybe that suggests that the old crop/new crop realignment has been done? The USDA reported that China had bought 220 TMT of new crop US soybeans. There's talk that China’s Sinograin bought four Brazilian bean cargoes earlier in the week for April/May shipment. Considering that China need to buy 4-5 cargoes/day to hit the USDA target for 2013/14 then this business can hardly be considered anything but a routine event. The latest Commitment of Traders report shows managed money decreasing their net long position by 14,790 contracts for the week through to Tuesday night. Next week's data will be interesting given the heavy selling also witnessed on Wednesday and Thursday this week. Yesterday's weekly export sales report means that the US now have 102% of the USDA's soymeal sales target on the books for 2012/13, so despite what the futures market might be saying, meal availability will stay tight for a month or two yet. Aug 13 Soybeans closed at USD13.49 3/4, down 5 1/2 cents; Nov 13 Soybeans closed at USD12.28 1/2, up 4 1/2 cents; Aug 13 Soybean Meal closed at USD430.30, down USD17.50; Aug 13 Soybean Oil closed at 43.58, down 23 points. For the week Aug 13 beans nose-dived to the tune of USD1.41 (9.5%), with new crop Nov 13 down 45 1/2 cents (3.6%), Aug 13 meal fell USD52.10 (10.8%) and Aug 13 oil shed 192 points (4.2%). Corn: Corn was down across the board, Sep 13 has closed lower every day this week, and now trades below USD5/bu for the first time for a front month on CBOT corn since October 2010. After a week like that you'd have maybe expected a bit of consolidation moving into a weekend with the crop in the middle of pollinating, but not today. The US weather outlook remains non threatening. Many Asian buyers are booking Black Sea feed wheat and/or corn in preference to US origin material. South Korea's MFG bought 60 TMT of optional origin feed wheat for Nov shipment today. South Korea's NOFI bought 65 TMT of optional origin (possibly from the Black Sea) corn for Jan shipment. The Philippines bought 100 TMT of optional origin (again possibly Black Sea) feed wheat for Sep/Oct shipment. Malaysia meanwhile is tendering for 120 TMT of optional origin corn for Oct/Dec shipment. US exporters did however announce the sale of 211,328 MT of US corn to unknown, split 8,128 MT old crop and 203,200 MT new crop. Yesterday's weekly export sales were below trade expectations, although cumulative sales do currently stand at 25% of the USDA forecast for the 2013/2014 marketing year versus a 5 year average of 17%. The weekly Commitment of Traders report shows managed money increasing their net short position by 46,099 contracts for the week through to Tuesday night, bringing their total net short position to 83,361 contracts. They're thought to have been further net sellers since. The Buenos Aires Grain Exchange estimated that 93.2% of the Argentine corn crop has now been harvested. Sep 13 Corn closed at USD4.92, down 4 cents; Dec 13 Corn closed at USD4.76, down 2 3/4 cents. For the week that puts Sep 13 corn 52 cents lower (down 9.6%), with new crop Dec 13 down 24 3/4 cents (4.9%). 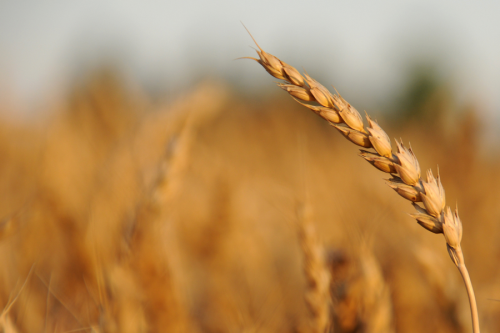 Wheat: The wheat market was narrowly mixed. Although the market looks like it would like to go higher corn weakness weighs. Yesterday's weekly export sales were better than trade expectations at 661,400 MT for the current marketing year, and included 177,900 MT to China. This is new non traditional business, and the US is well placed geographically to service this new demand, and they have the quality that China wants. Cumulative US sales stand at 42% of the USDA forecast for 2013/2014 marketing year, versus a 5 year average of 30% at this time. Egypt are also tentatively back in the market, albeit booking cheap Black Sea wheat, but at least they are taking it off the market. The ongoing Black Sea harvest looks likely to weigh on prices for the next few months at least however. The Ukraine winter wheat harvest is nearing completion at 86% done, and they only grow a very small volume of spring wheat. The Russian harvest however will rumble on for a good while yet at only 25% complete. The French soft wheat harvest is 14% complete. The German wheat harvest is just getting going. The weekly Commitment of Traders report shows managed money increasing their net short position in CBOT wheat by 14,401 contracts in the week through to Tuesday night. That brings their total net short position to 48,662 contracts. Any further losses in Chicago values in the weeks ahead may trigger some short-covering. Sep 13 CBOT Wheat closed at USD6.50 1/4, up 1 cent; Sep 13 KCBT Wheat closed at USD6.91 1/2, down 3/4 cent; Sep 13 MGEX Wheat closed at USD7.36 1/2, down 1 1/4 cents. For the week that means Chicago wheat lost 14 1/4 cents (2.1%), with Kansas down 13 1/2 cents (1.9%) and Minneapolis down 13 3/4 cents (1.8%). 26/07/13 -- EU grains ended the day mixed with maybe just a hint of pre-weekend consolidation going on after another week of prices gradually grinding lower. On the day both Nov 13 and Jan 14 London wheat closed unchanged at GBP162.75/tonne and GBP164.10/tonne respectively whilst Nov 13 Paris wheat settled EUR0.75/tonne easier at EUR187.75/tonne. There's no consolidation in sight yet for Paris rapeseed however, with Aug 13 closing EUR5.25/tonne lower at EUR356.75/tonne. For the week Nov 13 London wheat closed GBP4.75/tonne easier, whilst Nov 13 Paris wheat fell EUR6.50/tonne. Aug 13 Paris rapeseed slumped EUR22.75/tonne versus last Friday. For a front month in Paris wheat this was a 19-month closing low, and for Paris rapeseed this was a 3-year low. For Nov 13 London wheat this was the lowest close on the weekly chart in almost a year. Brussels issued 435 TMT of soft wheat export licensed this week (versus 300 TMT last week), talking the 2013/14 marketing year to date total to just over 1 MMT versus 613 TMT this time last year. Unusually, and for the second week running, the volume of barley export licenses issued outweighed those for wheat at 441 TMT bringing the 2013/14 YTD total to 888 TMT compared to 669 TMT a year ago. Ukraine's ProAgro group said that the country will harvest 2.2 MMT of rapeseed this year, up 76% on last year. Imports will rise 75% to 2.1 MMT, they added. Most of that will come to Europe. South Korea MFG bought 60 TMT of optional origin feed wheat for Nov shipment. The Philippines bought 100 TMT of optional origin (most likely from the Black Sea) feed wheat for Sep/Oct shipment. The latter traded at USD260/tonne including freight, which is the equivalent of just under GBP170/tonne, probably equating back to an ex farm price of no more than GBP130/tonne, if that. The Ukraine Ag Ministry said that as of July 25 Ukraine has harvested 25.33 MMT of grains on 8.67 million hectares, with an average yield of 2.92 MT/ha, 24% higher than a year ago. The winter barley harvest is 99% complete, with winter wheat at 86% done producing 18.55 MMT so far, suggesting final output of around 21 MMT which would be up by a third on last year. The Russian grain harvest is ongoing at 33.0 MMT off 25% of the planned area. Yields are said to be up 23.7% versus this time a year ago at 2.87 MT/ha. The wheat harvest stands at 27.4 MMT, with yields up 24% at 3.08 MT/ha and the barley harvest at over 3 MMT with yields of 2.47 MT/ha, up 7.4%. Germany's DBV said yesterday that winter barley yields there this season are highly variable, from up to 15% down on year ago levels to in some cases 20% higher. The recent warm and sunny weather at least means that moisture levels are low in the 12-15% region. 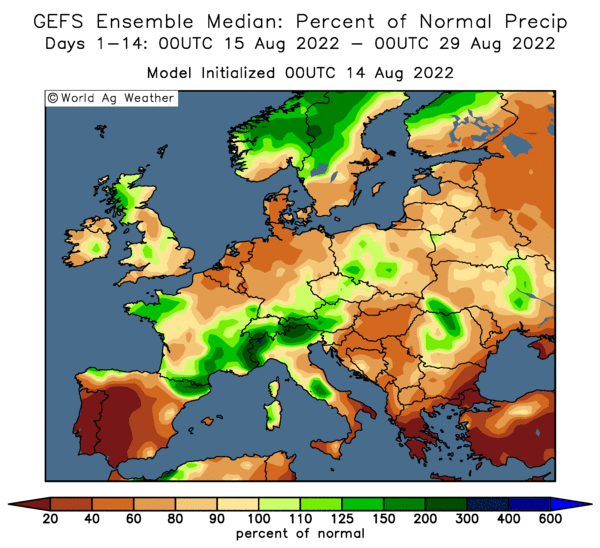 The German winter barley harvest could be over by the weekend, given the forecast for warm and dry conditions to continue through to Sunday, they added. They are forecasting a crop of 7.7 MMT, up 650 TMT on last year. The French winter barley harvest is also nearing completion, making huge strides this past week advancing from 49% complete to 94% done, according to today's estimates from FranceAgriMer. Winter wheat harvesting is now 14% complete versus 3% a week ago and 20% this time last year. French crop conditions are little changed, with soft wheat, winter barley and spring barley all declining one percentage point in the good/excellent category to 66%, 65% and 68% respectively. Corn good/excellent conditions were unchanged at 57%. Corn crop development is still severely lagging though, only 12% of the crop is pollinating versus 53% this time last year. 26/07/13 -- Rapemeal prices on the continent are sharply lower for a third day, following steep declines in CBOT soymeal. Ukraine analysts ProAgro forecast OSR production there to jump 76% to 2.2 MMT this year, with almost the entire crop (2.1 MMT) likely to be exported, and the vast majority of that will be coming to Europe. Paris rapeseed trades at lifetime contract lows, with Aug 13 at the lowest levels seen for a front month since August 2010. 25/07/13 -- Soycomplex: At this point it is tempting to just re-post yesterday's market report and simply change the date and see whether anybody can tell the differnce. Soybeans down heavily, with the biggest losses at the front end? Check. Meal locked in limit down? Check. Soybean oil at new lows not seen since October 2010? Check. Heavy fund selling across the board? Check. That's that then. Spec longs are scrambling for the exit, end users seem to have surprised them all by leaving themselves with adequate cover and nothing to buy. And all the time the harvest is drawing closer, and with it the prospect of a record US soybean crop. Aug 13 beans are now at the lowest for a front month since Jun 2012. The run-up to the highs of only a few days ago is said to have unearthed a surprisingly large volume of old crop soybeans on farm for sale. With new crop looming and the huge inverse that we've been seeing lately there's little point carrying old crop much longer, that has flushed physical sellers out at a time when the spec longs also want out ahead of first notice day. Fund selling today was estimated at 9,000 in beans and 7,000 in meal. Over the past two sessions funds are thought likely to have been net sellers of around 20,000 soybean lots and some 11,000 in meal. Aug 13 beans have now slumped USD1.65 in the past three sessions. Weekly export sales today were 128,300 MT of old crop and 665,200 MT of new crop, above trade expectations of a combined 300-650 TMT. Chinese industry analysts forecast China's July soybean imports at a record 7.3876 MMT, but these are then seen falling with August bean imports estimated at 5.6 MMT, September at 4.1 MMT and October at 3.9 MMT. Rumours have been in the market all week of China’s government planning to release 3 MMT of beans from reserves, although China’s Sinograin has denied these reports. Aug 13 Soybeans closed at USD13.55 1/4, down 37 1/4 cents; Nov 13 Soybeans closed at USD12.24, down 32 3/4 cents; Aug 13 Soybean Meal closed at USD447.80, down USD20.00; Aug 13 Soybean Oil closed at 43.81, down 45 points. Corn: The corn market also mirrored yesterday, falling, although not as heavily as soybeans - but also with the heaviest losses again coming in front end old crop Aug 13. That is now 32 1/2 cents below Monday night's close. Weekly export sales were sluggish at negative 27,900 MT on old crop, with sales of 515,900 MT for 2013/2014 delivery which were primarily for unknown destinations (319,800 MT). Trade expectations were for combined sales of 600-950 TMT. Yesterday's disappointing weekly ethanol grind numbers are also ringing in the bull's ears from a demand perspective. New crop Dec 13 corn set a new 2 1/2 year low as the prospect of a huge record US corn crop draws ever nearer. There are reports that the harvest is already underway in parts of Texas and Louisiana. The Commodity Weather Group, a US weather forecasting firm, estimated 2013 U corn yields at 159.5 bu/acre, that's 3 bu/acre ahead of the USDA's current estimate of 156.5 bu/acre and more than 29% up on the 2012 average yield of 123.4 bu/acre. MDA CropCast increased their US corn production estimate from 340.2 MMT last week to 343.1 MMT, a 32% increase on last year "due to improved conditions in the northwestern and eastern belt." Meanwhile US corn is missing out in various Asian tenders, Japan bought 300 TMT of Ukraine and Brazilian corn last week. South Korea's KFA today bought 60 TMT Black Sea origin corn for Jan shipment. South Korea's MFG bought 60 TMT of Black Sea origin corn for Jan shipment, and South Korea's Kocopia rejected all offers in a tender for 70 TMT of optional origin corn for Nov shipment. ProAgro estimated Ukraine’s 2013 corn crop at 23.6 MMT versus 20.9 MMT a year ago. They see Ukraine’s 2013/14 corn exports at a record 15.9 MMT. Indonesia’s Feed Millers Association estimated 2013 corn imports at 2.8 MMT, up from a previous estimate of 2.0 MMT and versus 2012 imports of 1.55 MMT. They said that Indonesia had imported 1.4 MMT of corn during the first half of 2013. Sep 13 Corn closed at USD4.96, down 12 1/4 cents; Dec 13 Corn closed at USD4.78 3/4, down 1 1/2 cents. Wheat: As with yesterday, wheat remains a follower. There are some bullish fundamentals for wheat, but re-establishing the traditional premium that it has historically commanded over corn isn't going to be an overnight job. Weekly export sales of 661,400 MT were ahead of trade estimates of 400-600 TMT and also included the welcome sight of China as the biggest buyer of the week a (177,900 MT). Today was the last day of the Wheat Quality Council’s US spring wheat tour. They estimated the US 2013 spring wheat yield at 44.9 bu/acre, exactly the same as a year ago and up on the 5 year average of 43.3 bu/acre. South Korea's KFA bought 60 TMT of Black Sea origin wheat for Oct/Nov shipment at USD258.45 C&F from Toepfer. Syria seeks 200 TMT of milling wheat with payment via frozen Syrian cash in EU and Arab banks. ProAgro estimated Ukraine’s 2013 wheat crop at 20.7 MMT versus 15.8 MMT a year ago. They estimate Ukraine's 2013/14 wheat exports at 8.4 MMT up 29%. Morocco said that they'd harvested a record 5.1 MMT of soft wheat along with a further 1.9 MMT of durum and 2.7 MMT of barley this year. That gives them a net grain harvest of 9.7 MMT, almost double production of 5.1 MMT in 2012, which will clearly limit their import requirements in 2013/14. The Moroccan state buyer is tendering for 160 TMT of soft wheat on the local market. The Saskatchewan government said most of their spring wheat and canola crops are in good to excellent condition. 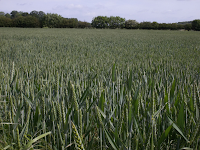 There are some reports that Brazil's 2013/14 wheat crop may have suffered frost damage this week. The Russian grain harvest is around 25% done, with early yields said to be up a similar percentage. How the remaining 75% of the harvest goes will be interesting as there is a widespread belief that the best of the crop is what has been cut so far and that spring sown wheat will yield poorly - in some cases even worse than last year. You never quite know with the Russians though. Are local governments are over-exaggerating losses to increase aid from Moscow? Time will tell. Sep 13 CBOT Wheat closed at USD6.49 1/4, down 4 cents; Sep 13 KCBT Wheat closed at USD6.92 1/4, down 5 cents; Sep 13 MGEX Wheat closed at USD7.37 3/4, down 5 3/4 cents. 25/07/13 -- EU wheat closed lower once more on what looks like harvest pressure and seasonal developments. Yet again Paris rapeseed took another slaughtering, falling to the lowest levels for a nearby month since Aug 2010. It's a job to know where this will end, the Aug 13 rapeseed contract expires next week but this total capitulation isn't just confined to the nearby contract, thither months were also sharply lower. Nov 13 London wheat ended the day GBP1.90/tonne lower at GBP162.25/tonne and with Jan 14 also closing down GBP1.90/tonne at GBP164.10/tonne. Nov 13 Paris wheat fell EUR1.75/tonne to close at EUR188.50/tonne. Friendless Aug Paris rapeseed ended EUR6.75/tonne easier at EUR362.00/tonne. This market is virtually friendless, it's as simple as that. These were all the lowest closes for a front month since ages ago, let's just leave it at that. The Black Sea countries generally have a big harvest and want to dump it onto the world market straight away - as was highlighted by another resounding success for Russian, Ukraine and Romanian wheat in yesterday's Egyptian tender. The average price paid there, including freight, was only around USD1.50/tonne more than the best offer on an FOB basis in France. Algeria meanwhile were said to have paid around USD273-274/tonne C&F (around GBP178-179/tonne dockside) for November shipment milling wheat yesterday, which is well below the cost of French replacement. Morocco announced today that they have just finished a 9.7 MMT harvest, up 90% from last year, including a record 5.1 MMT of soft wheat, 1.9 MMT of durum and 2.7 MMT of barley. Imports in 2013/14 are likely to be curtailed accordingly. The Russian grain harvest is said to be done on almost 25% of the planned area, producing a grain crop of 32.7 MMT so far, with yields up 24% at 2.89 MT/ha. That includes 27.3 MMT of wheat and more than 3 MMT of barley. 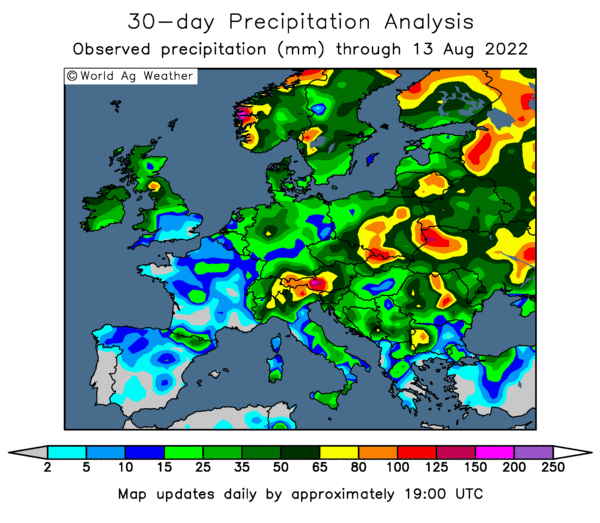 The French wheat harvest is said to have progressed into the north of the country, although recent activity has been disrupted by heavy rains and hail in places. The German winter barley harvest could be more or less done by the weekend. Yields are said to be averaging 6.4 MT/ha, although highly variable. Moisture levels are low at 12-15% due to the recent warm and sunny conditions. The German Farmers Association say that whilst the winter wheat harvest is also now underway, recent weather conditions mean that there are some quality worries. The wet spring has led to plenty of shallow rooted crops which may not be coping well with the sudden very warm and dry conditions, they said. Tunisia bought 75 TMT of feed barley at prices around USD260-264/tonne C&F for Aug/Oct shipment. Syria are tendering for 200 TMT of milling wheat on a humanitarian basis, with payment said to be set to come from assets frozen in EU and Arab bank accounts. ProAgro estimated Ukraine’s 2013 wheat crop at 20.7 MMT, up 31% versus 15.8 MMT a year ago. They have Ukraine’s 2013/14 wheat exports at 8.4 MMT, up 29% from a year ago. Is Anyone Going To York Races Tomorrow Night? 25/07/13 -- There's some sort of Cargill-related do on I understand. For those who haven't got a clue about one end of a horse from another, it may interest you to know that I've spotted a bit of a trend in certain races at York lately. Specifically, in sprints. Whilst not infallible (Disclaimer: always read the label, horses can run backwards as well as forwards etc) it would be interesting to know this trend wouldn't it? Just in case you fancied a flutter. Well, I've noticed an inordinate number of recent sprint races have been getting won by horses drawn high, the higher the better. Now in handicaps, which in theory see every horse weighted according to their ability and chance of winning the race, any advantage helps doesn't it? A sprint is a shorter race by definition and thus those with an advantage are more likely to scramble across the line first aided by it, than in longer races where the disadvantaged have more time to make up the lost ground. It's far more interesting than the grain market this isn't it? And easier to call some might say. Most of the sprint handicaps at York lately (and many of the non-handicaps too) have been won by horses drawn high. The higher the better. Indeed in some cases, the first two home have been drawn high. 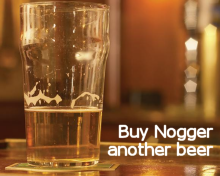 If you don't mind spreading your bets around a little you could get a decent return. 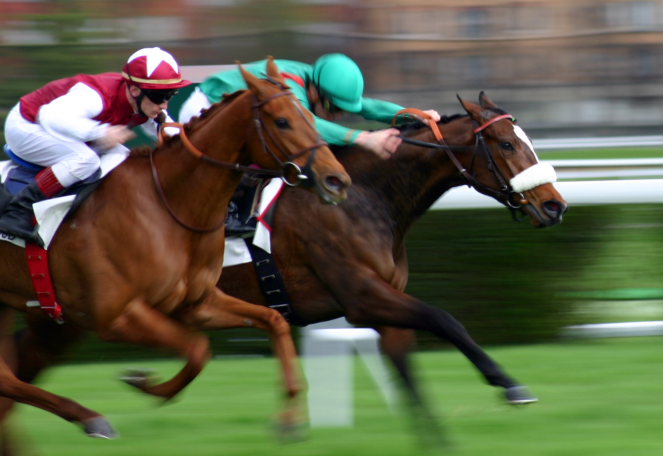 Like Jun 15, in a 6-furlong handicap the first two home in an 18 runner race were drawn 18 and 15. The winner paid 16/1, the second 20/1 and the forecast over 300/1. The day before at the same meeting a 19 runner 5-furlong handicap, cut down to 16 by a few non runners, was won by the horse drawn 19 at 11/2 with the 18 horse (20/1) just touched off by 1/2 length from bringing in the forecast, finishing third. At the last meeting on Jul 12 a 15 runner 5-furlong handicap was won by the horse drawn 13 (at 20/1) with 11 coming second (10/1) for a 200/1 forecast. Incidentally there were no sprint handicaps on the second day of that meeting, but there were two sprint non-handicaps. Want to know the result? The first, a 9 horse race won by the horse drawn 9 at 16/1. The other, only a five horse race to be fair, was won by the horse drawn 5 at 17/2. There are two sprint handicaps to get your teeth into tomorrow, the 6.30 and the 8.30 (conveniently the last race of the day - get out of jail free). 6.30: Medici Time (drawn 20); Picture Dealer (19); Mount Hollow (18) and Sunraider (17). 8.30: Tumblewind (drawn 13); Bapak Sayang (12) and Dusty Storm (11). What could possibly go wrong? Why lose money on the wheat market when you can know your fate in the space of a minute at York races? And don't forget to come back and hit the donate button on Monday morning. 25/07/13 -- Rapemeal prices on the continent are finally showing signs of some long overdue capitulation. A limit down move in nearby Chicago soymeal values last night, and the overnight Globex market also locked in limit down this morning have the market under pressure today. Paris rapeseed futures meanwhile are setting lifetime contract lows on an almost daily basis, with Aug 13 down to levels not seen in a front month since August 2010 today. 24/07/13 -- Soycomplex: Extreme volatility continues with both front month beans and meal closing down the daily limit. Meal, which was limit up on Monday and traded between USD18 higher and USD18 lower yesterday, now closes limit down! Meanwhile the Aug 13/Nov 13 soybean spread, which was as wide as USD2.31 3/4 on Monday night has narrowed by almost a dollar in just two days to end at USD1.35 3/4 this evening. There are clearly too many front end spec longs that don't want to get caught having to take delivery with first notice day just a week away. With such a wide disparity between old and new crop months something had to give I suppose, but don't rule out further volatility and more erratic behaviour in the run up to the expiry of the Aug 13 contracts three weeks from now. There were over 58,000 contracts offered over at limit down in the August meal contract, with synthetic trade around USD25-30/tonne below the limit down close of USD467.80, so we can expect sharply lower trade again in the morning when the Globex market opens. Rumour continues that the Chinese government may release 3.0 MMT of beans from reserves. The USDA estimate for Chinese soybean imports of a record 69 MMT in 2013/14 looks too ambitious at the moment. Trade estimates for tomorrow's weekly export sales report for beans are 300-650 TMT. Aug 13 Soybeans closed at USD13.92 1/2, down 70 cents; Nov 13 Soybeans closed at USD12.56 3/4, down 3 1/2 cents; Aug 13 Soybean Meal closed at USD467.80, down USD20.00; Aug 13 Soybean Oil closed at 44.26, down 52 points - another fresh lifetime contract low and the worst close for a front month since October 2010. Corn: As with soybeans the largest losses came in the front month, narrowing the old crop/new crop spread. The Sep 13/Dec 13 differential, which was 42 3/4 cents on Monday night, is now down to 28 cents tonight. The US weather remains non threatening with the corn crop in the middle of the key pollination phase. The trade is now starting to think that just one more month of relatively benign weather and this potentially monster crop could be home and hosed. "Very heavy rainfall is predicted in the updated GFS model targeting the driest corn states Nebraska and southern Iowa, 1.5 to 2.5 inches. Strong thunderstorms would be fuelled by a moist air stream from tropical Mexico, the southwest monsoon. Very cool temperatures would continue several more days, considered beneficial conserving available soil moisture. Corn especially needs rainfall in the key pollination period, which is now underway," said Martell Crop Projections. The weekly ethanol grind offered no support whatsoever, with production down from 881,000 barrels/day two weeks ago, to 876,000 bpd last week and now 853,000 bpd this time round. Taiwan bought a combo of 23 TMT of US old crop corn and 12 TMT of US old crop beans for Aug Sept shipment to fill a little gap until new crop comes along. South Korea bought 120 TMT of optional origin corn for Dec/Jan shipment at around USD236-237/tonne C&F. South Korea also bought 69 TMT of South American corn for Jan shipment. Trade estimates for tomorrow's weekly export sales report for corn are 600-950 TMT. Last week's sales were 152,900 MT of old crop and an impressive 1,590,800 MT of new crop. Sep 13 Corn closed at USD5.08 1/4, down 14 1/4 cents; Dec 13 Corn closed at USD4.80 1/4, down 5 1/4 cents. Wheat: The wheat market was only modestly lower, and now seems to be attempting to re-establish the historic premium over corn that we would normally expect. At tonight's closing levels Sep 13 CBOT wheat is a premium of USD1.45 over Sep 13 corn. As recently as last Friday the difference was only USD1.20 1/2. Potentially much more demand from China than was envisaged a couple of months ago, and the re-emergence of Egypt back into the market are adding support to wheat. There's now talk that China may need to buy 10-15 MMT of wheat in 2013/14, just last month the USDA only had that number down as being 3.5 MMT. Egypt were back in the market tendering for wheat today, buying 240 TMT of Russian, Ukraine and Romanian origin material to add to the 300 TMT of similar origin wheat that they bought last week. It might not be US wheat that they are buying, but it mops up some of the cheaper Black Sea offers that are around at least. Algeria have also been active, buying "at least" 400 TMT of optional origin wheat today to add to the 575 TMT that they were said to have bought earlier in the month. Iraq are tendering for 50 TMT of US, Canadian, or Australian wheat. Meanwhile the jungle drums are starting to suggest that Russia's 2013 wheat harvest, currently officially progressing well, is about to run into trouble once the combines get stuck into the spring planted crop (which typically accounts for around 40% of national production). Trade estimates for tomorrow's weekly export sales report are 400-600 TMT versus 996,600 MT last week. The trade will be looking to see if China features there. Sep 13 CBOT Wheat closed at USD6.53 1/4, down 1/2 cent; Sep 13 KCBT Wheat closed at USD6.97 1/4, down 1 3/4 cents; Sep 13 MGEX Wheat closed at USD7.43 1/2, down 1/2 cent. 24/07/13 -- EU grains were mixed, consolidating a little from some of the recent losses. Nearby Nov 13 Paris wheat fell below EUR190/tonne at one point yesterday, for the first time since Dec 2011, before closing at a lifetime contract low, whilst Nov 13 London wheat finished at a 12-month low. Maybe a degree of consolidation was therefore in order. London wheat closed with front month Nov 13 GBP0.15/tonne firmer at GBP164.65/tonne, Jan 14 was GBP0.25/tonne higher at GBP166.00/tonne and Nov 13 Paris wheat was unchanged at EUR190.25/tonne. The head of Russia’s Grain Producers Union estimated that drought will cut wheat production for there to 45-48 MMT versus the USDA's 54 MMT and the Ministry's forecast of no less than 50 MMT. The Tatarstan region has currently harvested 14% of their grain crop, with yields averaging only 2.01 MT/ha, less than 5% up on last year's disaster, and yields are expected to decline as the harvest progresses from winter sown crops into those that were spring sown. The shop window however shows that nationally Russian grain yields are currently up 24.6% at 2.94 MT/ha, producing a crop of 31.9 MMT so far. 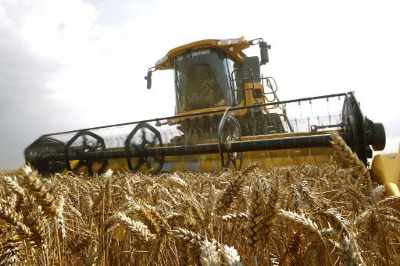 Wheat yields are said to be almost 26% higher at 3.11 MT/ha, producing a crop of 26.6 MMT. The Russian Grain Producers Union, who of course have a vested interest on coming in at the low end of trade expectations, estimate the 2013/14 grain crop at only 75-80 MMT, way down from 95 MMT predicted by the government, and only approximately in line with the 77.2 MMT produced last year. Also potentially crucially they have the 2013/14 grain exportable surplus at 15-15.7 MMT - around the same as in 2012/13 and far less than the market currently expects. Current low prices are flushing out some interest on international markets. Algeria reportedly bought "at least" 400,000 MT of wheat for November shipment overnight on an optional-origin basis. Prices were said to have been around USD273-274/tonne C&F versus the circa USD269/tonne paid last week for Sep/Oct shipment material. Egypt’s GASC issued their second wheat tender in a week for an unspecific tonnage of wheat for shipment September 1-10. As with last week, Russian, Ukraine and Romanian wheat got the nod with French origin material said to be priced out to the tune of around USD10/tonne before freight costs. They finished up buying 240 TMT in total at around USD252/tonne. The Bureau of Meteorology in Australia estimated that the chance of exceeding median rainfall for August-October is more than 80% for southern New South Wales, parts of Victoria, and southeast South Australia. Ukraine said that they'd exported 746 TMT of grains in the Jul 1-23 period, including almost 111 TMT of wheat, 398 TMT of barley and 235 TMT of corn. The Ukraine government are said to have bought over 1 MMT of wheat locally for the domestic intervention fund in an effort to support prices. The added that they plan to raise their local purchase price. 24/07/13 -- Rapemeal prices on the continent are lower across the board, following declines in CBOT soymeal values last night and on impending harvesting of the EU 2013 rapeseed crop. Harvesting in Ukraine is nearing completion, and the crop looks like being more than 50% up on last year's levels. 23/07/13 -- Soycomplex: A very volatile session saw front end beans and meal collapse, Aug 13 meal traded between USD18 up and USD18 down during the session, before settling towards the lower end of that range. Aug 13 beans also ended sharply lower in what was described as a very crowded bull market one week ahead of first notice day, by Benson Quinn Commodities. August options expire Friday too. Reports that China is considering releasing 3 MMT of state-owned soybeans onto the market may have helped change sentiment a little. Few expect that the USDA's target for Chinese soybean imports of 69 MMT in 2013/14 will be met, with 64 MMT maybe nearer the mark, potentially adding 5 MMT to global bottom line ending stocks next year. US weather conditions remain non threatening, recent rainfall will help improve conditions as the crop edges towards the all-important month of August. Aug 13 Soybeans closed at USD14.62 1/2, down 57 3/4 cents; Nov 13 Soybeans closed at USD12.60 1/4, down 28 1/4 cents; Aug 13 Soybean Meal closed at USD487.80, down USD14.60; Aug 13 Soybean Oil closed at 44.78, down 63 points - another fresh lowest close for a front month since October 2010. Corn: As with soybeans, US weather conditions are being seen as "near ideal" by many with normal temperatures and rains of 1/2 to 1 1/2 inches for much of the Corn Belt expected this week. Few areas are looking at temperatures higher than the mid-90's. Dec corn stayed below USD5/bu for the duration of the session, posting a new 2 1/2 year low of USD4.82/bu, and not closing too far off that intra day low. The market will be looking to see if the next support level of USD4.79/bu can hold. Resistance is now at USD4.94/bu and USD5.02/bu. The USDA announced the sale of 106,400 MT of US corn to neighbouring Mexico, which included 11,000 MT of old crop. US corn doesn't feature into most destinations though. Japan bought 300 TMT of Ukraine (120 TMT) and Brazil corn (180 TMT) for Oct/Dec shipment yesterday. US corn was said to be priced out to the tune of USD20/tonne versus Brazilian origin and USD30/tonne versus Ukraine origin material. 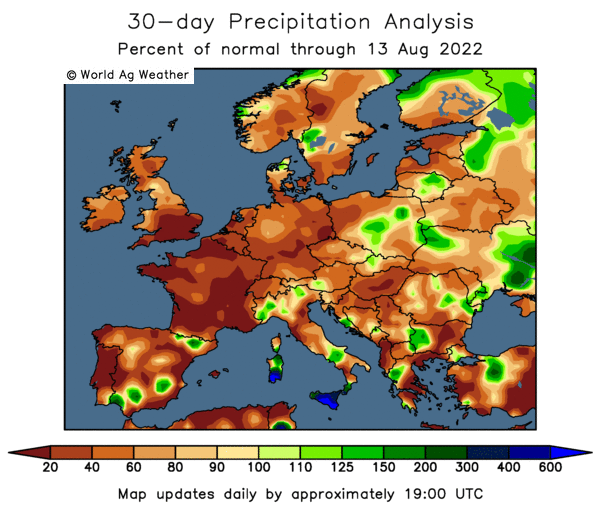 Rain expected in France this week could provide corn there with a needed boost. Chinese weather is also considered favourable for corn yields. The weekly ethanol production numbers are out tomorrow. Last week ethanol production fell to 876,000 barrels/day from 881,000 bpd the previous week. Sep 13 Corn closed at USD5.22 1/2, down 18 1/4 cents; Dec 13 Corn closed at USD4.85 1/2, down 12 1/2 cents. Wheat: Wheat closed lower on all three exchanges for a second session in a row. Corn offered no support. The first day of the annual Spring Wheat tour in the Dakotas reported yield potential at or above average. Harvesting there is said to be only 2-3 weeks away. Ukraine's winter wheat crop is 81% harvested, producing 17.16 MMT so far. Based on that result this season's harvest should certainly exceed 20 MMT, and maybe even 21 MMT, versus the current USDA forecast of 19.5 MMT. Russia's wheat harvest currently stands at 25.4 MMT with yields up 24% versus last year. Buyers are looking for cheaper alternatives to wheat. Tunisia are tendering for 100 TMT of feed barley for Aug/Oct shipment. Their 2013 grain harvest is said to be sharply lower than last year's 2.2 MMT at 1.2 MMT due to drought. Jordan are also in the market for feed barley, tendering for 100 TMT for Jan/Feb shipment. Egypt are said to be likely to ask the Russian government for deferred payment terms on wheat shipments, after being rebuffed by Russian exporters themselves. Russia's Jul 1-17 grain exports were said to be almost 1 MMT, including 772 TMT of wheat. Sep 13 CBOT Wheat closed at USD6.53 3/4, down 6 cents; Sep 13 KCBT Wheat closed at USD6.99, down 3 cents; Sep 13 MGEX Wheat closed at USD7.44, down 2 3/4 cents. 23/07/13 -- EU grains ended lower, extending the recent slide, on harvest pressure. London wheat began the day higher, trying to consolidate a little, but with the pound rising to a 4-week high against the dollar, weaker US markets and new crop Dec CBOT corn slumping to its lowest levels since Nov 2010, holding onto those gains was never going to those early be easy. And so it proved. Benchmark Nov 13 London wheat closed GBP1.65/tonne weaker at GBP164.50/tonne, with Jan 14 down GBP1.50/tonne to GBP165.75/tonne and Nov 13 Paris wheat settling EUR2.25/tonne easier at EUR190.25/tonne. The Spanish Ag Ministry forecast soft wheat production there up 29% this year to 6.01 MMT, with all wheat output rising 35% to 6.89 MMT. The barley crop, of which Spain is the highest spring producer in the EU, is forecast even higher at 41% up on 2012 at 8.41 MMT. Corn production is also seen rising 7% to 4.53 MMT. Tunisia's cereal crop is not seeing doing so well, down from a previous Ministry forecast of 1.36 MMT to only 1.2 MMT, a substantial drop on output of 2.2 MMT last year. It's output in the Black Sea, particularly Ukraine, that is weighing on market sentiment though. Their grain harvest currently stands at 23.47 MMT, with average yields up 25% on last year at 2.86 MT/ha. That includes a winter wheat harvest of 17.16 MMT so far, off 81% of the planned area, which suggests final output of around 21 MMT. That would be up 33% up on last year and above the USDA's current forecast of 19.5 MMT. The Ukraine barley harvest currently stands at 5.55 MMT, roughly split 50:50 between winter and spring sown crops. The winter barley harvest is almost over at 98% done, with the spring harvest 66% complete. The 2013 OSR harvest is 90% done at 1.92 MMT, suggesting final output in excess of 2 MMT, a 50% increase on last year. Agritel forecast 2013/14 Ukraine wheat exports at 9 MMT versus 8 MMT from the USDA and 7.2 MMT in 2012/13, barley exports are seen at 2 MMT. Russia's grain harvest is currently seen at 30.7 MMT, with average yields up 22% at 2.98 MT/ha. That includes 25.4 MMT of wheat (yields up 24%) and 2.6 MMT of barley (yields up a more modest 6%). Russia's grain exports for Jul 1-17 stood at just under 1 MMT, an increase of 10% versus last year. Of that wheat accounted for 772 TMT. IKAR yesterday increased their forecast for Jul 13 wheat exports from 1 MMT to 1.2 MMT. The Kazakhstan Ministry forecast a 2013 grain crop of 15 MMT, up 17% versus last year. French market prices see OSR offered at EUR371/tonne (circa GBP320/tonne) on an FOB basis Moselle for August shipment. New crop milling wheat is offered at EUR190/tonne (circa GBP164/tonne) deld store. New crop barley is EUR176/tonne (circa GBP152/tonne) deld store. 23/07/13 -- Rapemeal prices on the continent are mostly lower today, despite a precipitous rise in Chicago soymeal values last night and again this morning. 22/07/13 -- Soycomplex: It was a continuation of the same old theme, with nearby months posting strong gains on strong demand, tight US stocks and a likely late harvest further exacerbating the front end squeeze. Aug 13 meal closed limit up bid, with front month beans gaining almost 30 cents. This was a lifetime contract high for Aug 13 meal, whilst Aug 13 soybean oil closed at a new lowest close for a front month since October 2010. Everybody wants meal and nobody wants oil it would seem. The USDA continue to stand behind their "line in the sand" of 2012/13 US soybean ending stocks of 125 million bushels, but most believe that things are/will be far tighter than that. "One private analyst lowered its 12/13 soybean ending stocks estimate over the weekend to 95 to 105 million bushels due to higher than expected June NOPA crush," said Benson Quinn Commodities. The same analyst cut 2013/14 US soybean ending stocks to 240 million bushels versus the USDA's current 295 million estimate. 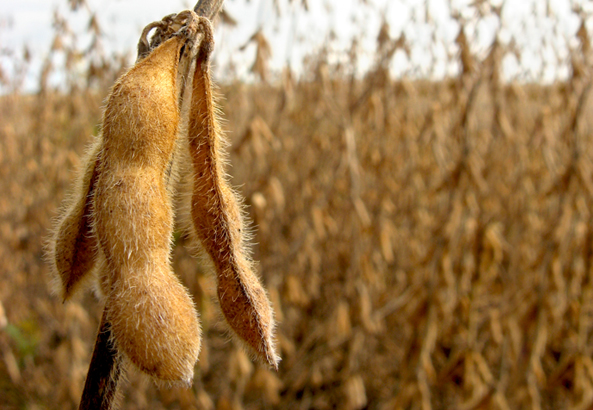 Oil World estimated the global 2013/14 soybean crop at 284.22 MMT versus 265.02 MMT in 2012/13 and 285.89 MMT from the USDA. They see the US crop at 92.0 MMT versus 82.0 MMT last year and 93.0 MMT from the USDA. Brazilian output is pegged at 84.0 MMT (vs. 81.5 MMT and 85.0 MMT respectively) with the Argentine crop at 52.3 MMT (vs. 48.5 MMT and 53.5 MMT). Weekly soybean export inspections came in at 2.847 million bushels, low but in line with expectations. After the close the USDA cut US soybean crop conditions good to excellent by 1% from a week ago to 64%. They have blooming at 46% versus 26% a week ago and 59% fro the 5-year average. The proportion of the crop setting pods is 8% versus 33% a year ago and 19% for the 5-year average. Aug 13 Soybeans closed at USD15.20 1/4, up 29 1/2 cents; Nov 13 Soybeans closed at USD12.88 1/2, up 14 1/2 cents; Aug 13 Soybean Meal closed at USD502.40, up the daily USD20.00 limit; Aug 13 Soybean Oil closed at 45.41, down 9 points. Corn: Weekly export inspections came in at 8.867 million bushels, down sharply from 16.338 million a week ago and below the 10-16 million that was expected. US weather offers a generally non threatening outlook for the rest of the week. Safras e Mercado estimated Brazil’s second corn crop at 45.2 MMT, down from a previous forecast of 45.8 MMT, although well up on 38.0 MMT in 2012 and still a record. Japan were said to have bought 300 TMT of Ukraine (120 TMT) and Brazil corn (180 TMT) for Oct/Dec shipment in preference to US origin. They have been gradually decreasing the volume of corn used in feed over the past year/18 months and also moving away from more expensive US corn, giving a greater proportion of their business to South America and the Black Sea. Vietnam bought 20 TMT of South American corn for Nov/Dec shipment. The Brazilian vessel line up shows 3.5 MMT of Brazilian corn waiting to be shipped in August. Analysts expect 2013 Brazilian corn exports to be 15-17 MMT. In the 1st half of 2013 Brazil exported 8.4 MMT of corn. The USDA's FAS in Russia estimated their 2013 corn crop at 9.0 MMT versus 8.21 MMT last year, with exports seen rising from 2.0 MMT in 2012/13 to 2.5 MMT in 2013/14. The EU Commission's MARS unit forecast corn yields in the EU at 7.22 MT/ha, up from the 7.13 MT/ha forecast in June and 18.9% higher than in 2012. A Reuters poll of 7 analysts estimated South Africa’s 2013 corn crop at 11.134 MMT versus 11.83 MMT in 2012. After the close the USDA cut good/excellent US corn crop ratings by 3 percentage points from last week to 63%. The proportion of the crop silking (pollinating) was raised to 43% from 16% a week ago, but down on 56% for the 5-year average. Sep 13 Corn closed at USD5.40 3/4, down 3 1/4 cents; Dec 13 Corn closed at USD4.98, down 2 3/4 cents. Wheat: Wheat closed around 3-4 cents lower on all three exchanges. IKAR said Russia had exported 700 TMT of wheat between July 1-20th and raised their estimate for full month exports from 1.0 MMT to 1.2 MMT. Iraq bought 50 TMT of Australian wheat for August shipment, at prices said to be well above offers out of the Black Sea, for quality reasons. They will likely not be so fussy next time round. Algeria are tendering for a nominal 50 TMT of optional origin milling wheat for Nov shipment. They bought 575 TMT in their last tender around a week ago. The USDA's FAS in Russia estimated wheat production there this year at 53.0 MMT, up sharply from 37.72 MMT last year, although 1 MMT below the current official USDA forecast. He sees 2013/14 Russian wheat exports rising from 11.2 MMT in 2012/13 to 17.0 MMT this season. The USDA's FAS in Kazakhstan cut his forecast for wheat production there from 14.5 MMT to 14.0 MMT citing drought in some parts of the country and a lower planted area than previously thought. The early wheat harvest is underway in the Kazakh region of Almaty, with early yields said to be 2.5 MT/ha versus only 1.0 MT/ha last year. Ukraine's Ag Ministry said that the country had exported 640 TMT of grains so far this month and will ship 24.82 MMT in the full 2013/14 season, other estimates are as high as 29 MMT (record). Weekly export inspections came in at 23.136 million bushels, down slightly on 24.459 million the previous week and at the low end of expectations. After the close the USDA said that the US winter wheat harvest was 75% complete versus 67% a week ago and 76% for the 5-year average. Spring wheat crop conditions are 68% good to excellent, down 2% from a week ago. Sep 13 CBOT Wheat closed at USD6.59 3/4, down 4 3/4 cents; Sep 13 KCBT Wheat closed at USD7.02, down 3 1/4 cents; Sep 13 MGEX Wheat closed at USD7.46 3/4, down 3 3/4 cents. 22/07/13 -- EU wheat closed lower, in a relatively slow start to the trading week, although one not without one or two interesting developments. Nov 13 London wheat ended the day GBP1.65/tonne lower at GBP165.85/tonne and with Jan 14 also closing down GBP1.65/tonne at GBP167.25/tonne. Nov 13 Paris wheat fell EUR1.75/tonne to close at EUR192.50/tonne. Friendless Aug Paris rapeseed is falling faster than Felix Baumgartner after a particularly heavy Sunday lunch, ending EUR8.50/tonne easier at EUR371.00/tonne -the lowest for a front month since August 2010. The on, off, UK bioethanol plant Ensus - one of the largest in Europe - has been sold to German company CropEnergies AG, a member of the Südzucker Group who are the largest sugar producer in Europe, at a fraction of the original cost of building the plant which only opened three years ago. CropEnergies already operate bioethanol production plants in Germany, Belgium and France. They say that the move will potentially increase its annual production capacity of bioethanol by 50% to more than 1.2 million cubic metres and that they plan to spend more than GBP50 million improving the competitiveness of the plant. That's good news for domestic wheat demand on the face of it, with Ensus potentially requiring around a tenth of the UK crop in 2013/14 were it to run at full capacity and operate on 100% wheat. Although there are a couple of fairly large "ifs" there. It may be that the new owners will continue to also incorporate a certain percentage of corn into the grind, as Ensus were doing when the plant was last operational, and if they do decide to do that then they may also opt to wait until cheap new crop Black Sea material comes onto the market. There are reports of Black Sea corn for November shipment being available CIFFO (prior to discharge and storage/transport costs) into the UK in the lower GBP150's. Other interesting news today concerned the announcement last Friday that the US Federal Reserve were going to review their 2003 decision to allow investment banks to trade and store physical commodities, and what the implications of that might be for the grains sector. On the fundamental news front, the EU Commission's MARS unit released their July yield forecasts today, increasing their projections for wheat, barley, corn and rapeseed on an EU-wide basis. The yield forecasts for soft wheat were in fact raised for twenty four of the EU-28 countries with the exception of Italy, Bulgaria, Finland and Greece. They now project EU all wheat yields at 5.45 MT/ha, up from the 5.32 MT/ha predicted last month and a 5.0% increase on last season. For all barley they estimate yields averaging 4.78 MT/ha versus 4.68 MT/ha in June and up 9.1% compared to 2012. For corn they are now looking for an average EU-28 yield of 7.22 MT/ha, versus 7.13 MT/ha in June and up 18.9% compared with 2012. OSR yields are seen at 3.08 MT/ha (versus 3.02 MT/ha last month although still down slightly on 3.11 MT/ha in 2012). Spanish grain yields potential are said to be amongst the highest on record, up more than 50% in the case of wheat compared to 2012, and rising by over 75% in the case of barley. In the UK, wheat yields were estimated at an average 7.90 MT/ha, up 18.7% versus last year (and compared to the 7.63 MT/ha forecast in June). Barley yields here are called at 5.69 MT/ha, up 3.1% compared with 2012 and versus the 5.54 MT/ha predicted a month ago. OSR yields were estimated at 3.32 MT/ha, the same as in June and slightly lower (-2.1%) than the 3.40 MT/ha achieved in 2012. Considering the air of total despondency around concerning the prospects for UK rapeseed yields earlier in the year that would be very impressive, if it can be achieved. 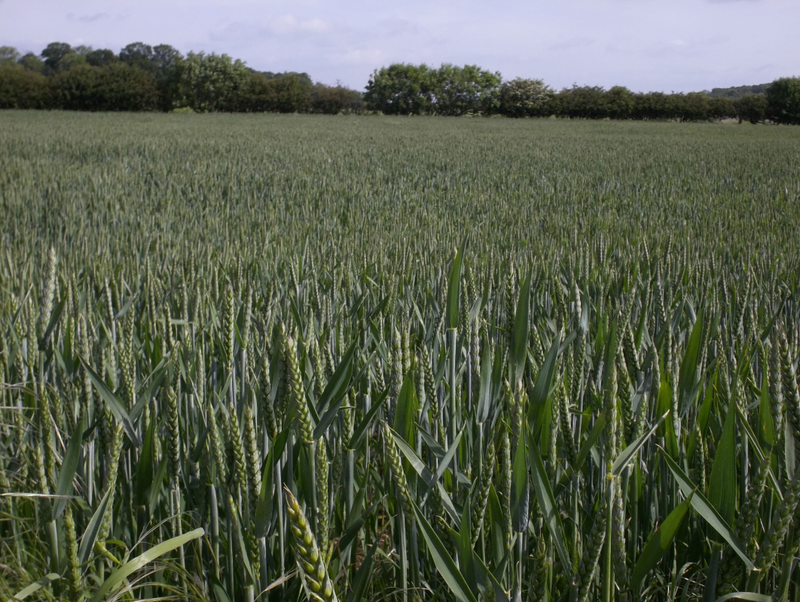 "With relatively dry days and mild temperatures, the period from 1 June until 15 July has brought favourable conditions for (UK) crop growth that improve the outlook for reasonable yields," they said. French wheat and barley yield potential was increased versus June, although corn's prospects were cut. German wheat and barley yields were also raised from last month, with corn potential left unchanged. Essentially the warmer and drier weather experienced in the last 6 weeks has been of benefit to wheat and barley, but not so for corn, they suggested. Separately to MARS the HGCA today released their forecasts for the UK harvested area for 2013. That gave us a UK wheat area down 19% versus 2012 at 1.61 million acres, whilst the total barley area is seen up 26% at 1.23 million ha and the total OSR area pegged 9% lower than last year at 686k ha. If the HGCA are correct with their area estimates, and MARS also on the ball with their yield forecasts (two more sizeable "ifs" I'll grant you), then the UK will harvest 12.7 MMT of wheat, 7.0 MMT of barley and 2.28 MMT of OSR this year - all far better results than almost anybody imagined a few months ago! 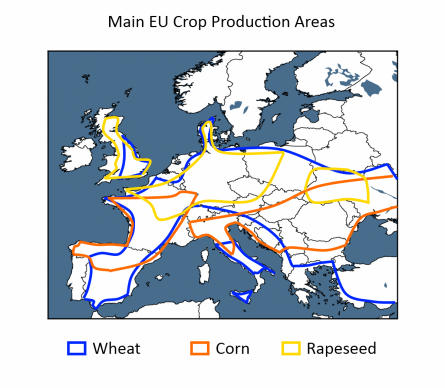 22/07/13 -- Rapemeal prices on the continent are mostly firmer today, with the exception of nearby July, which continues to fall to realign itself closer to new crop levels. 22/07/13 -- The overnight market sees beans and meal continuing to add nearby premium. Why on earth was Aug 13 such a substantial discount to Jul 13 when the latter expired a little over a week ago? Corn is 2-3 cents easier on the overnight Globex market, with new crop Dec 13 crucially back below the USD5/bu mark. Wheat is 1-2 cents firmer. Both London and Paris wheat are up a tad. Poor old Paris rapeseed, what on earth are we going to do with that? Front month Aug 13 is down EUR5.75/tonne again this morning, to trade at EUR373.75/tonne. 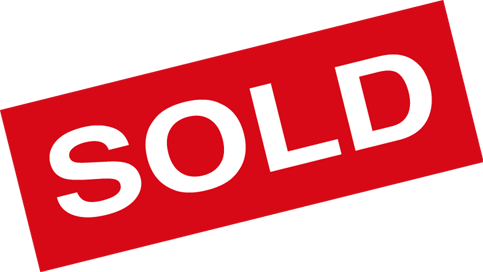 The contract closed at EUR439.50/tonne on the first trading day of June. The news that Ensus has been sold to the Germans will sound promising for the wheat bulls. Let's wait and see what happens there. Will they open straight away, or will they prefer to sit tight and wait for cheap new crop corn to come along first? Indeed will they continue to use corn, or switch back to 100% wheat? Or could they even increase the percentage of corn used in the grist? Questions, questions. That's better than orders, orders, though I suppose. Catching me eye over the weekend, and potentially something that may not be music to the bull's ears, was news that the Fed announced late Friday that they were going to review their decision (made in 2003) to allow investment banks to trade and hold physical commodities. 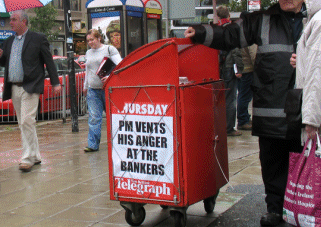 Ten years ago was the start of the beginning of the banks/funds love affair with commodities of course. As things stand right now there is no suggestion that the Fed might extend this possible U-turn on trading physical commodities into trading futures in commodities. However, the first question to ask is "well, if they think that trading physical commodities is/might be causing the unprecedented volatility that we've seen in the markets since 2003, who's to say that they won't next turn their attention to futures trading as well?" We might also want to ponder "might the banks/funds view this potential change of heart on trading the physicals as a time to get out/cut back on futures trading now, before it becomes compulsory and they all have to exit at the same time, with the inevitable consequences?" It's very difficult to operate in a market where the rules at the start of the game are prone to get changed at half-time, and could be completely different again by the time the final whistle blows. (Unless of course if you are a Man Utd supporter- in which case this is perfectly normal). Oil World say that global oilseed production in 2013/14 will increase 4.5% to 479.69 MMT. They have the world OSR crop down at 63.47 MMT, up 1.5%, with the EU-28 crop rising to 20.40 MMT, an increase of 5.1% on last year. They estimate the world sunseed crop up 7.9% at 38.73 MMT, with production in Europe rising to 8.07 MMT, an increase of 17.1% versus last year. The USDA attaché in Kazakhstan has cut his wheat production estimate there to 14.0 MMT versus 14.5 MMT from the USDA themselves, on drought in some parts and a lower planted area than originally expected. The early Kazakh harvest is underway in the Almaty region, with very early yields said to be 2.5 MT/ha versus only 1.0 MT/ha a year ago. 22/07/13 -- Breaking news this morning is that stop-start UK bioethanol business Ensus has been sold for a knock-down price to German firm CropEnergies AG, a member of the Südzucker Group, the largest sugar producer in Europe. CropEnergies say that they plan to invest more than GBP50 million to improve the competitiveness of the plant. The acquisition was said to have been completed on Friday "by a contribution in kind in return for the issuance of 2.25 million new CropEnergies shares. The issuing price per share is EUR5.98 (GBP5.15), ex dividend, corresponding to a total value of EUR13.5 million (around GBP11.6 million)." CropEnergies already operates bioethanol production plants in Germany, Belgium and France. They say that the move will potentially increase its annual production capacity of bioethanol by 50% to more than 1.2 million cubic metres. Conceptualised in heady days of 2006, the plant was said to have been built for a total cost of GBP250 million, although subsequent additional expenditure may have taken that figure as high as GBP300 million according to some estimates.